We have come to a portion of Acts that may seem like a boring description of a very boring trip. But there is actually a lot more in this passage than I am going to preach on. In fact, I want to give you two sample lessons that you can pursue on your own as I lay the background for what is happening. The first lesson that you could learn from this passage is patience in pursuing our goals. We need to realize that the first eight verses cover almost two months of time, and the whole voyage to Rome that ends in chapter 28:14 took six and a half months. That's from mid-August to the end of February. That's a lot of waiting for a goal that God has clearly communicated - that Paul was going to be in Rome. Why does God make us wait? 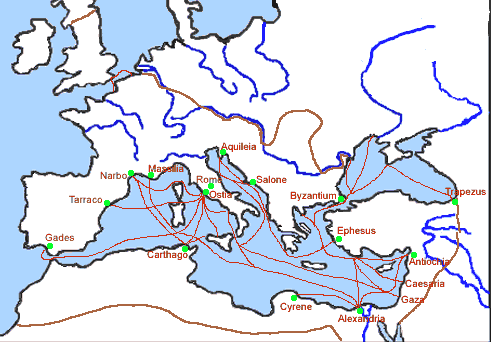 When you look at the inset map, you will see that it was not the most direct of the Roman routes to Italy. The big red arrow on the main map shows the most direct route. But contrary winds forced them to go the long way around, and even that was painfully tedious. I read one account of bucking exactly these kinds of contrary winds, and it took weeks to tack back and forth what would have ordinarily only taken a couple days. No wonder it took Paul so long. In fact, on this account that I read, there were some days where they wondered if they were making any progress. Have you ever felt like that – like your wheels were just spinning and you are not getting anywhere? God could have allowed Paul to travel when the winds were with the ship, but He did not. He made him patiently take a long detour. Why? I think this passage gives some hints. Secondly, there are lessons of being willing to face discomfort without complaining. There is no hint in these verses that Luke feels sorry for himself. And that is remarkable given the description of this trip. Think of the nausea and the tedium. I have read accounts of sailing in such winds, and the large waves produced would have made many of these passengers so sick they would wish they were dead. It's one thing to feel sick on a merry go round for an hour or two, but day after day to feel sicker and sicker tends to produce complaining. But even those who weren't sick could complain about the tedium of it all. They had to tack back and forth almost the whole way to Cnidus. Now there was some danger. Verses 7 and 8 indicate that they probably had their hearts in their mouth on at least two occasions in trying to make port without getting slammed into the reefs. Sailing was not nearly as easy as steaming. In the late 1800's James Smith, a sea captain, made exactly this trip, studying all the details of Paul's voyage, and writing a book that has added a great deal of knowledge about this trip. I had fun reading that book, but he pointed out that this was no fun. And if you think that the Christian life is only about fun, then this passage has some lessons to teach you about endurance without complaining. But we are going to look at some other lessons. Let's go back to the beginning of their trip in verse 1: "And when it was decided that we should sail to Italy, they delivered Paul and some other prisoners to one named Julius, a centurion of the Augustan Regiment." It says, "when it was decided." Who made these decisions? It wasn't Paul. It was Festus and those who governed with him. And he didn't just make decisions about where Paul was going, which boat to take, when to take it, but he also made the decision of who was going to go with Paul. Even his companions were chosen for him. Now Julius ended up being a great companion and a very noble and influential member of the Augustan Regiment. Even his name shows his status. This may have been one of the imperial guards that started winning other soldiers of Caesar's household to Christ. So that was a tremendous contact and God used all of the happenings of this trip for this soldier's conversion. I think that's why his name was particularly mentioned. But what about all the low-life that was crowded onto the boat with Paul? Verse 37 says that there were 276 people on board, and a good number of those were criminals destined to fight or be destroyed at Nero's Coliseum. Commentators assume that because the word for "other" in "other prisoners" is not the Greek "other" of a similar kind, but "other" of a totally different kind. These were not headed to a trial like Paul, but were criminals headed to a sentencing – and since the destination was Rome, the place intended was almost certainly the Coliseum. And a number of commentators point out that taking prisoners from this region to the Coliseum was common. Nero needed the sport. And it may explain why the soldiers were eager to kill the prisoners later in the chapter. They were disposable. So Paul had to live on deck with some low life people who no doubt weren't the greatest companions. But they were part of God's answers to his prayers. God continues to use even the ornery and hostile unbelievers that have made life miserable for you. They might think that they are making decisions to be in your life, but God was the ultimate decider all along. The famous preacher, F.B. Meyer was crossing the Atlantic one time, and was asked to preach to the first class passengers. Someone asked an agnostic after the service, "What did you think of Dr. Meyer's sermon?" "I didn't believe a word of it," he answered. Dr. Meyer preached that afternoon to the fourth class passengers, and the agnostic followed just to hear what he would say and to have ammunition to mock. On the way in to the room, he saw an elderly lady sitting in her deck chair fast asleep with her hands opened as if in prayer. And he thought he would play a joke on her. He gently put two oranges into her hands, but she didn't wake up. When he came out of the meeting he saw her eating an orange and said, "You seem to be enjoying that orange." She replied, "Yes sir, my Father is good to me?" "Your father? Surely your father can't still be alive!" he mocked. She said, "Praise God, He is very much alive. I've been seasick for days. I was asking God somehow to send me an orange. I suppose I fell asleep while I was praying. When I awoke, I found He had not only sent me one orange, but two!" God worked through a mocking agnostic, just as God worked through the decisions of Paul's unbelieving companions, however bad the motives were for their decisions. But there were other companions that would have cheered Paul up. The first was Luke, which we can gather from the word "we." Luke includes himself as one of the passengers. The second was Paul's friend Aristarchus, mentioned in verse 2, and mentioned again in Colossians 4:10 as being Paul's fellow-prisoner. Now I say that Festus decided all of that, but in reality every companion Paul had – the sweet and the difficult – were all decided ultimately by God. And in similar ways God has already arranged your companions along the way to your own Italy – your destination. He's involved us in your life – the members of this congregation. He has sovereignly arranged your neighbors, your work associates, and your friends in the home school cooperative. He's given you children with sweet personalities, and He has sovereignly given some of you challenges. But they are all gifts of His goodness. And you can't passively think of those as chance arrangements. You need to realize that God has placed those companions here. Just as Paul didn't have a choice, we often would not have picked the companions that we have. But rather than seeing these criminals as an unpleasant situation, Paul looked at it as an opportunity. "Lord, what are you doing? Let me get on board," should be our attitude. And this trip would prove to be a blessing in the lives of all of these passengers. And I would encourage you to look at the decisions that are made for you (over which you have no control) with an eye to God's providence. Hopefully the Providential History Festival has gotten you thinking this way. Know for a certainty that it isn't just your Italy that is destined for your good. It is also the way you get there, the difficulties on the way, and the scenery, and the provisions, and the friends, and the difficult people that you have to relate to. If you begin seeing these decisions that are out of your hands as being the sovereign work of God for your good, it will help you to sail against the winds with the same kind of optimism that Paul had. Can you say "Amen" to God's providences? Psalm 107 goes through all kinds of difficult providences and kindnesses and says over and over, "Oh, that men would give thanks to the LORD for His goodness, and for His wonderful works to the children of men!" Look at verse 2: "So entering a ship of Adramyttium, we put to sea, meaning to sail along the coasts of Asia. Aristarchus, a Macedonian of Thessalonica, was with us." It says, "meaning to sail along the coasts of Asia." This is speaking of intentions. Where point I looks at God's sovereignty over past decisions that we can't do anything about, this verse speaks of God's sovereignty over our present intentions and plans. Because Julius couldn't find a ship headed to Italy that was large enough to accommodate all of his prisoners, he decided to start looking in the ports of Asia until he found one bound for Rome. They didn't have travel agents who could book your flights back then. You had to either wait till the ship you wanted showed up, or travel to other hubs where there were more ships. And Myra was one of those big hubs for grain distribution. In God's sovereignty, they were starting this trip rather late in the season (mid August), and it probably factored into Julius' decision not to wait for an Italian ship at Caesarea. If they waited it might get too late. The outcome might have been totally different if he had. Instead, he opts to start sailing along the coast and to try to find a large Italy-bound ship. Initially it looks great because the winds are with them and they make their first port stop in one day. That's fast traveling. But after that everyone would begin to regret this trip with every hour that went by. But it was too late. Their intentions had taken them too far to turn back. I think of Adoniram Judson. He wanted to go to India so badly. And he tried, and tried, and tried to do so. He was blocked at every attempt. Finally, when he secretly landed directly against the orders of the East India Company, that pretty much ruled the area, someone reported him to the company. Adoniram was warned to flee, but the only boat available to flee on was a boat to Burma. And the rest is history. He has gone down in history as one of the great missionaries, and almost an entire tribe, called the Karen, was converted to the Lord in Burma. God sovereignly overruled his intentions. But if it weren't for those intentions to go to India, he wouldn't have gotten to Burma either. Man proposes; God disposes. And in these next verses we can see God's handwriting all over these intentions of Julius and crew. Everybody probably regretted having made this northward decision, but God is even in the stupid mistakes that we make. In one sense, my decision to go to a private college was a waste of a huge amount of money that I had saved up, and if I had to do it over again, I would not have gone. But God was in that intention, and without it I would never have met Kathy as my wife. Our intention was not to get stuck with the Farnam property, but God was in our intention and overruling our intention, and has made it the vehicle for some pretty neat ministry. This is not to make us lazy in our intentions and plans. Sometimes we need to repent of those intentions. But it is to say that you should not ever let regrets rule your life. Don't keep regretting your past intentions. If there was sin, confess the sin, and then go on with the realization that God uses even those wretched intentions to drive us closer to Him. If you have suffered from plans that weren't the best, thank God that He is sovereign over even those. Don't shudder over your poor planning. Learn from it, yes. But thank God that He brings good out of even our intentions. So we have looked at past decisions in God's plan, and present intentions in God's plan. Let's look thirdly at how God strews kindnesses into our lives as well. Look at verse 3: "And the next day we landed at Sidon." [There's the first kindness. Beautiful conditions for sailing. That is about the most you could travel in one day, and they did it. Here comes a second kindness:] "And Julius treated Paul kindly and gave him liberty to go to his friends and receive care." This was an unusual courtesy that Julius extended – to let Paul spend the whole time that the ship was being unloaded at the church in Sidon. In fact, this was such a kindness that the Greek word used here is the word we get philanthropy from. The last phrase, "and receive care" is the third kindness in this verse. The church gave Paul all the provisions or care packages that he would need for his journey. This may have involved clothes for the winter months, food, money, and possibly other supplies. God is so good. He could have left Paul without any of these niceties for the entire six months, but God loads him up with kindnesses to sustain him during the tough times ahead. And you know what? When you survey your life and look at all of the painful times, you will also notice that God has strewn all kinds of kindnesses here and there – friends who encouraged you, gifts, precious visits from relatives, and other blessings. But this was reciprocal too. God cares about each of the saints. One of the reasons for this tortuous trip was because God cared about the saints in Sidon, who would have been recipients of Paul's ministry. God cared about the needs of those in Myra, and the large body of elect who would get saved on the island of Malta. God strews His kindnesses in everybody's lives all along the trip. We tend to forget about those bright days during the dark times of despondency. But it appears that Paul was able to appreciate each kindness as it came and make the best of it. We need to imitate him in that. But we come next to the heart of the sermon – that even the contrary winds are part of God's plan. We don't just thank God in every circumstance. Ephesians 5:20 admonishes us to thank God for all things – yes, even for the contrary winds that He sends our way. Verse 4 says, "When we had put to sea from there, we sailed under the shelter of Cyprus, because the winds were contrary." 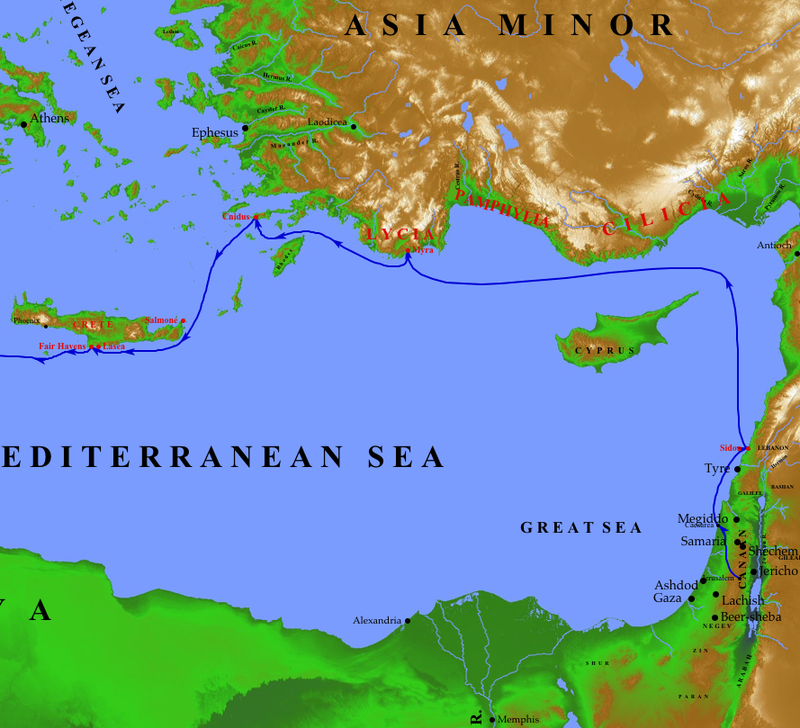 Though the blue line on the map doesn't show it precisely, they probably headed toward the first peninsula of Cyprus and sailed around the west side, continuing to head north west until they found a bit more shelter on the coast where (with the aid of the westward currents that flowed, and the occasional land breezes), they could have slowly tacked their way westward. But think of all the memories that this island would have evoked in Paul, and the prayers it would have stirred up. This was the place of one of the great ministries of Barnabas, Paul, and John Mark. This was the place where Paul had pronounced a curse upon Elymas the Sorcerer. This was the place where the magistrate, Sergius Paulus was converted. During contrary winds, give yourself balance by remembering God's faithfulness in the past. Anyway, passing Cypress on the port side, they continued slowly on to the mainland. Verses 5 and 6: "And when we had sailed over the sea which is off Cilicia and Pamphylia, we came to Myra, a city of Lycia. There the centurion found an Alexandrian ship sailing to Italy, and he put us on board." They stopped for a brief time in Myra, and God had a plan for that city. Tradition tells us that the short time Paul was in that city, he preached the Gospel and won converts, who after he left produced a church that survived for centuries. Nothing is coincidental, including your airport stops. I had one longer layover in Chicago, waiting to get home. And I was really pressed for time on my sermon, so had to practice it there in the airport. As I walked back and forth with my bible in hand, my lips must have been moving because people were looking at me strangely. I smiled and said, "Don't worry, I'm not crazy. I just have to practice my sermon for tomorrow," and started to walk on. Well, one of them said, "Why don't you preach it to us." So I did, and a crowd gathered around, hearing the same sermon you guys would hear the next day. You never know what God is going to do through your brief stops, and you need to be sensitive to His leading and take advantage of your Myras. What are your Myras? Perhaps it's the people you are meeting at a homeschool conference, or maybe it is a political meeting that you are at and someone asks you a good question, or perhaps it is the meter reader who shares that her husband is sick, and you offer to pray right then and there. You never know what God will bring out of a Myra stop. Once they found the ship of Alexandria, Julius was perhaps more hopeful. These ships, though privately owned, were part of a government corporation to supply the empire with grain, and were expertly run. Everyone thought the highest of these Alexandrian captains. They were very experienced. And their ships were massive ships for that time, running 180 feet long, 45 feet wide, and having a forty-foot draught. But progress was painful. Verse 7 says, "When we had sailed slowly many days, and arrived with difficulty off Cnidus, the wind not permitting us to proceed, we sailed under the shelter of Crete off Salmone." It must have been quite the wind for it to take so many days to get to Cnidus. Commentators appear to agree that they would ordinarily have waited in the port of Cnidus until better winds would let them go west. But apparently it was full and not available. Most commentators indicate that one of the Greek words here indicates that they were not allowed to port there. But whether that is true or not, for some reason they don't stay. They tried to go north of Crete in a westerly direction, but the wind did not permit it. They no longer had the advantage of the westerly current that ran along the coast and had been helping them some. So they were driven southeast. Modern vessels can sail nearer to the wind than classical ones, and several experts who have studied the course that this ship was blown on, and who know the make up of these ships, say that six points was the maximum limits that they could safely go. So they can tell a lot about this trip based on that knowledge. The first phrase of the next verse indicates that it was a struggle to keep the ship on a course where it wouldn't miss the island. So we know that this was quite a boisterous wind that almost swept them completely past Crete and out into the open sea. Of course, part of the steerage problem was the waves themselves. 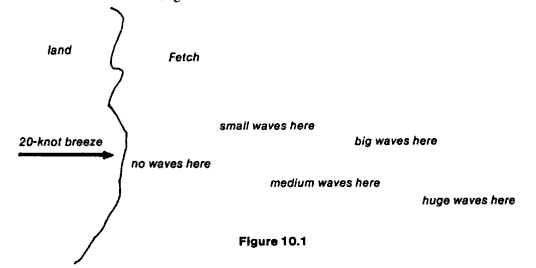 The further away from land you get the more fetch you have, and the greater the fetch and the longer the wind has been blowing, the larger the waves. Well it's been blowing for a long time. This book says, "In relatively open water, 20 knots of wind could easily create 6 to 10-foot waves." And it appears that the wind was at least 20 knots, if not more. Commentators assume anywhere from 40-70 knots wind during the storm that they got shipwrecked in, but the winds they have been battling for days have no doubt made many of them nauseous and weak. It was with difficulty that they gained the southern coast of the island. But once past Salmone, they could sail on the leeward side of Crete, which would protect them from the northwest winds – at least to some degree. But it appears from verse 8 that even sailing along the southern coast of Crete was proving to be very difficult, so the wind must have been quite strong. Verse 8 says, "Passing it with difficulty, we came to a place called Fair Havens, near the city of Lasea." What do we learn from these verses we've just read? We learn that even an apostle Paul had to sometimes face tough winds that were not convenient. Don't think that there is something wrong with you when God allows contrary winds. It's worth self-examination, but only for a moment. God will let you know if you are a Jonah and your contrary winds are because of sin. But that is only one of twenty purposes God has for contrary winds. Sometimes it is for our own growth and to test our mettle. Sometimes it is to enable others in the body to come alongside of you and help you. Maybe He has brought these winds so that you are forced to take body life seriously and receive help from others. But in part God includes such information so that we don't think that bad things can't happen to godly people. He includes such things so that we can remember that God causes even such winds to work together for our good and the advancement of the kingdom. Let me finish that story of Adoniram Judson, because I think it fits here so perfectly. He was a man of remarkable endurance, vision, and abilities. He was the perfect candidate to open the work in Burma. The trouble is, he wasn't interested in Burma. He dreaded the lawless tyranny in that country. So like Paul in this chapter, despite decisions and intentions to go to India, God led him to Burma. As I mentioned earlier, when he tried to go to India to engage in missions, everything seemed to go against him. French pirates captured his ship, and he was put into the stinking hold with the other prisoners. During that stormy detour to France the prisoners in the hold were so sick that the air was constantly thick with sour stench of vomit, and he was miserable beyond description. He spent time in Paris in a jail until an American appeared out of nowhere and gained him release. Who knows – the American may have even been an angel. He seemed to come out of nowhere. But Judson wondered, "Lord, why are You slowing me down?" Yet God used him to impact people in France that he would otherwise never have met. His next attempted trip to India was also miserable with the winds against them. But it gave him prolonged ministry on the ship to the sailors. And then, almost immediately after arriving in India he and his wife were kicked out by the East India Company who wanted no missionaries in that land. They had come all that way, yet the government officials absolutely refused to let them into the country. He tried again and again to enter, only to be rebuffed. He spent four months on the Isle of France, ministering to English soldiers. Mrs. Judson wrote, "Oh, when will my wanderings terminate?" I'm sure Paul felt that way in this chapter. It seemed like he was just tacking, and zigzagging endlessly on that sea. Well, in the same way it seemed that Judson's travels were against headwinds and their destination was always elusive. One of their trips seemed to be almost endless tacking against headwinds with almost no progress being made. They were seasick and miserable. And yet how they handled that seasickness in a godly way has become a testimony for all time. It is related that the old English missionary, St. Cuthbert, was driven by a snow-storm upon the coast of Fife. His companions [complained]. "The snow closes the road along the shore; the storm bars our way over the sea." "But," Cuthbert said, "there is still the way of heaven that lies open." And I want to encourage you to believe that no matter how miserable your present circumstances may be, you are on the road that heaven has ordained, and though it may be circuitous and endless tacking, it is leading to your Italy. It is leading to your safe haven. You can rest assured of that. But because hope deferred can make the heart sick and frustrated, it is important that we learn to appreciate the process as an adventure as well. When our children used to ask us in the car, "Are we there yet?" we would try to get them to learn to appreciate the journey as much as the destination. Sometimes it was with conversation, sometimes looking at the scenery, sometimes with games, and reading. And I know that God's zigzag courses can sometimes be frustrating to some of you, but He takes them because they are needed. I think of Exodus 18:17. It says, "Then it came to pass, when Pharaoh had let the people go, that God did not lead them by way of the land of the Philistines, although that was near; for God said, ‘Lest perhaps the people change their minds when they see war, and return to Egypt." They weren't ready for war. They needed time to grow and mature. They needed to be brought to a place where they could say with the missionaries we grew up with – where He leads me I will follow and what He feeds me I will swallow. The second part was sometimes the hardest part. They had to swallow some pretty nasty food. But I love the way that verses 8-9 show how God never gives us more than we can handle. "Passing it with difficulty, we came to a place called Fair Havens, near the city of Lasea. Now when much time had been spent…" etc. The winds were so bad, that they didn't dare to sail away from that place. And this provided an opportunity for Paul and his companions to rest. What an appropriate name – Fair Havens. This was God's resting time for Paul before Paul would have to tackle an even harder project. No matter how dark things may appear, you too will reach your fair haven in God's good timing. I would like to read Psalm 107:23-31, which I think so aptly summarizes God getting us through. Psalms 107:25 For He commands and raises the stormy wind, Which lifts up the waves of the sea. Psalms 107:26 They mount up to the heavens, They go down again to the depths; Their soul melts because of trouble. Psalms 107:28 Then they cry out to the LORD in their trouble, And He brings them out of their distresses. Psalms 107:29* He calms the storm, So that its waves are still. Psalms 107:30 Then they are glad because they are quiet; So He guides them to their desired haven. Psalms 107:31 Oh, that men would give thanks to the LORD for His goodness, And for His wonderful works to the children of men! We can thank God in the midst of the storm because God not only stills the storm, but He makes the storm. Knowing that can give us courage to sail against the wind. Let me end by giving a quote that I can't track down to its source. But it says, "Kites rise highest against the wind not with it." When you pull a kite, you won't get anywhere running with the wind. You need to run against the wind. If you want to press into the upward call that God has given to you in Christ Jesus, be willing to sail against the wind. It was sailing against the wind that enabled Paul to bring encouragement to Sidon, plant a church in Myra, bring the Gospel to 276 passengers and crew, win the centurion Julius, and grow in his own character, and encourage the hearts of countless people down through history who have read this account. Nothing was wasted – including contrary winds that frustrated and hindered their best intentions in verse 2, slowed them down and distressed them in verses 8-9, frightened them in verse 18, and made them almost lose all hope in verse 20. Even though you may prefer the soft winds of verse 13, I charge you to not despise God's contrary winds. Learn by God's grace to ride out the storms of life with trust and joy in God's goodness. Learn that though you may lose your ship, you cannot lose your soul. Learn that your sufferings are worth it. And learn how to fellowship with God and be sustained by Him through it all. Amen.